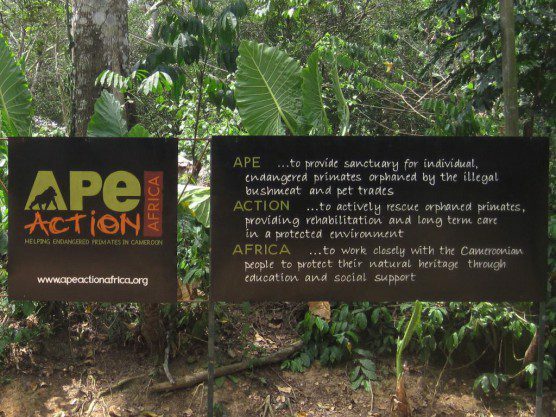 Ape Action Africa is one of the largest primate sanctuaries on the continent, and IPPL is proud to help support the wonderful rescue work the AAA staff is doing in Cameroon. 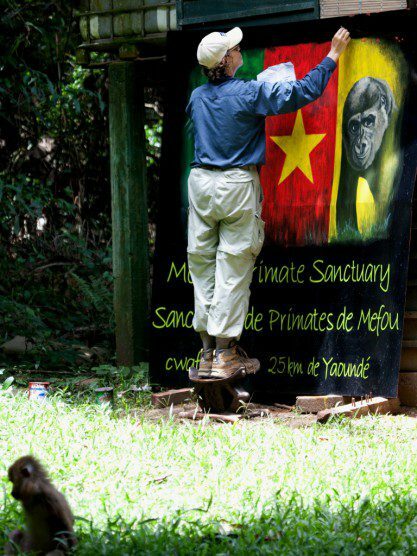 AAA (formerly the Cameroon Wildlife Aid Fund) makes use of many volunteers, and last week the IPPL Headquarters Sanctuary was host to one of them: meet Robin Huffman, one of AAA’s biggest fans and most dedicated volunteers! 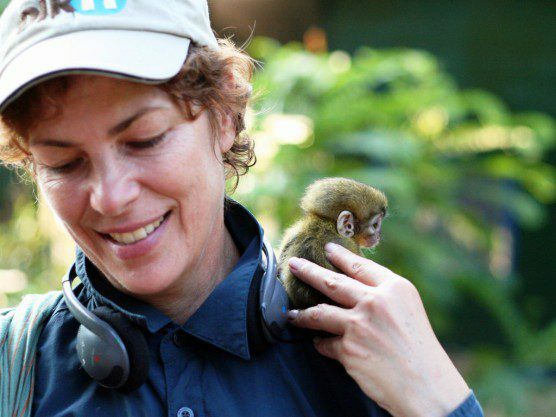 “In 2006,” Robin says, “I had an epiphany at a career seminar.” She realized that she wanted to A) get close to gorillas, and B) work for a small or medium-sized nonprofit that was geared toward animal protection. That first condition was unlikely to be met in New York City, where she was then living. So she gave up her 30-year career as a corporate interior designer and project manager (and her Manhattan salary) to completely shift gears. Robin now spends her time volunteering, mostly at primate sanctuaries; she lives life on the go and has become accustomed to a typical sanctuary diet of rice, beans, plantains, and cabbage. And to living with limited Internet access. And to pumping her own drinking water. 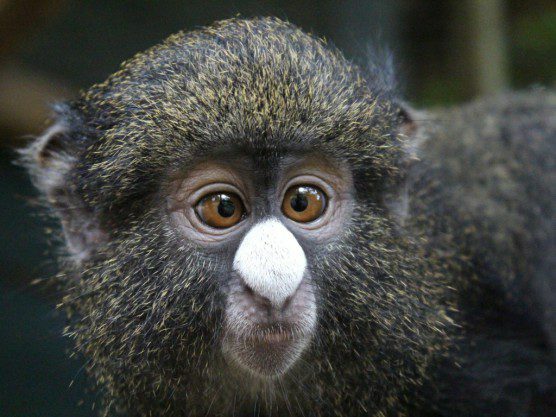 In addition to AAA, she has spent time at places like the Centre ValBio conservation research station in Madagascar, the Vervet Monkey Foundation, the C.A.R.E. baboon rescue center (both in South Africa), and most recently IPPL, in South Carolina! But even before she transformed her life’s direction, she had already traveled widely. She was a “Navy brat” as a youngster (with stops in Hawaii, Las Vegas, and Scotland, among others) and a curious world traveler as an adult (from Nepal to Scandinavia to Morocco to Singapore, and beyond). One trip was different from all the others, however. In 2007, she went to AAA for the first time, prepared to spend three months there. At the sanctuary, she met a baby moustached guenon named Maasai. The frightened, dehydrated, flea-ridden infant had been orphaned, so Robin was asked to be its caregiver. And when she gazed into that infant’s eyes as she cradled the little monkey in her palm, Robin knew that she had found her vocation. Since then, she has helped handrear many primate infants at AAA: mangabeys, guenons, an olive baboon, as well as (briefly) a few chimps and a gorilla. Nearly all of them have been rescued from the cruel trade in bushmeat and illegal pets, and they all need some TLC—which Robin is glad to provide. She has since returned to AAA five more times, putting in a total of two and a half years there, and she takes on whatever tasks are needed. If she’s not handraising an infant—in which case there’s always night duty—her day starts at 6:30 AM with helping to feed breakfast (the primates get three meals a day). Then it’s a steady workday involving anything from painting signs and billboards (she hand-letters everything) to construction (she always travels with her own hammer, screwdrivers, and wire-cutters) to cleaning cages (her toolkit includes a spackle scraper for removing stubborn encrusted bits) to selling tickets and souvenirs to visitors. 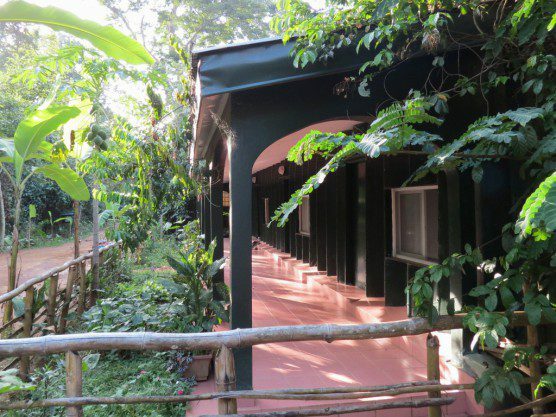 AAA currently occupies more than 2,100 acres of secondary forest, some of it a former cocoa plantation. There are a good 16 electric-fenced enclosures, each with night quarters or satellite housing, that cover about 625 of those acres. 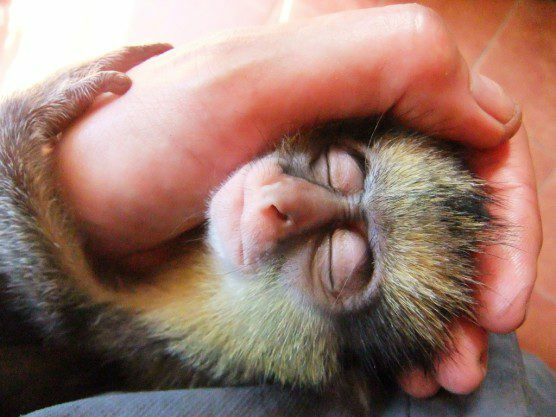 The staff and volunteers care for nearly 360 primates, at last count. The sanctuary is open for guided tours daily, which helps AAA bring in some revenue. Although Robin loves putting her artistic and managerial skills to use wherever necessary, her favorite task is caring for the young orphans. One thing she enjoys doing is giving them “nutritious treats throughout the day that are also fun to play with,” says Robin. She likes to offer them oatmeal with raisins wrapped in leaf-and-vine packages, scatterings of peanuts, and small logs from the forest that come complete with fungi and edible insects. 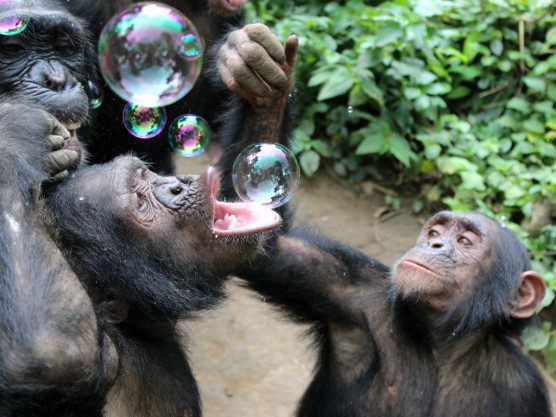 She also likes to create enrichment devices like hammocks, ladders, and trampolines from the limited materials at hand: making things that are “easy to clean and safe but fun” for the young primates in her care “brings out my greatest creativity,” says Robin. Our young gibbon Spanky approves of Robin’s efforts to brighten up the neighborhood. 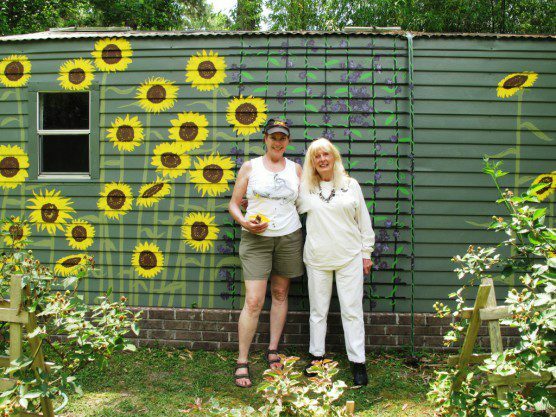 We were glad to welcome Robin to this part of the South Carolina Lowcountry and tap into some of her creativity, ourselves. She had not been back to this area since her family’s ten-month residence in the 1960s but very much enjoyed her recent stay. 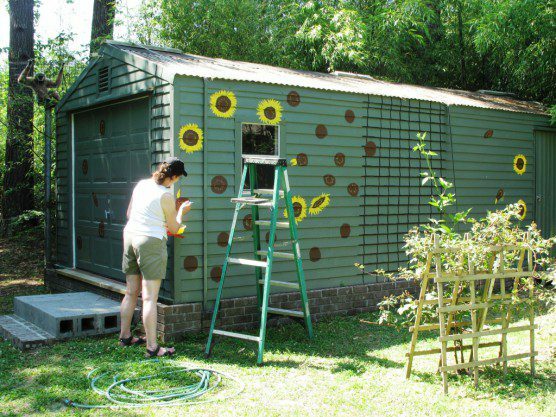 Here at IPPL, she used her newfound artistic skills to transform our quarantine quarters into a virtual flower garden. She is welcome to plant herself here anytime! Shirley and all of us at IPPL were glad for a chance to get to know Robin—a multi-talented and dedicated sanctuary volunteer. That’s wonderful, Juan! Check out http://www.apeactionafrica.org/get-involved/volunteer, where you can download their volunteer handbook and application form. You can also contact them at volunteer@apeactionafrica.org for more information. Good luck! Dear Shirley, Sharon and everyone at IPPL….AND gibbons! It was an honor and a joy to spend time with you, and to finally meet you, Shirley, after hearing about you and IPPL at all the sanctuaries. I hope to see you again sometime soon! It was lovely having you here, Robin! I hope your travels bring you our way again soon!